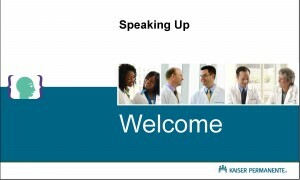 The Speaking Up Trainer’s Toolkit includes messages, step-by-step instructions, examples, scenarios and PowerPoint slides that teach staff and physicians effective techniques for speaking up for patient and worker safety. Lessons are designed to be used during team meetings, huddles or one-on-one conversations. The training is accessible from any Internet-enabled device, including smartphones, inside or outside the KP network. Ten just-in-time sessions to choose from based on a team’s needs or interests. Sessions last between 20 and 60 minutes each. This course is intended for anyone, including team co-leads, members or sponsors, who wants to deliver short, in-person training to others. For in-person classroom training, contact your regional training leaders for more information.